Cylinder Head Gasket, LH (driver side). Fits 90~95 ZR-1 LT5. This gasket has been developed and custom manufactured exclusively for Jerrys Gaskets. It is a direct replacement for the OEM head gasket and also suitable for modified, non-stock engines. 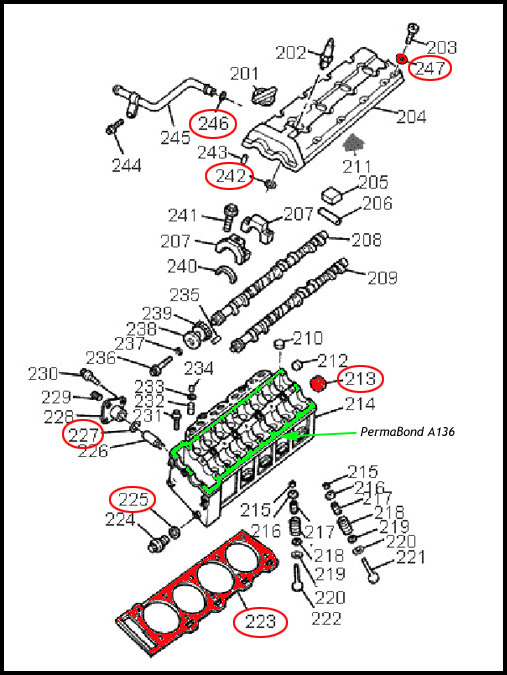 Please download the free Technical Data Sheet Jerrys Gaskets Cylinder Head Tech Data for more details regarding composition, dimensions, differences compared to the OEM gasket and installation instructions. The LT5 w/14.4:1 compression withstood sustained high RPM & overheating! 07Mar17: Time to update the progress of the Beast: we are prepping for the 2017 SpeedWeek Aug 12-19. Last year we had horrible conditions with the car never being able to complete the course as it got loose in the 3-4 mile section resulting in sideways chute pulls at 225 mph. Very exciting to say the least. But it is clearly evident that the hp is there for a record if we can stay hooked up. Currently working on a prototype of a larger throttle body in the hope of a few more hp. Oh and a big shout out to Jerrys Gaskets, we lost a freeze plug out the back of one of the heads during a run, the motor got smoking hot but the Head gaskets held!! NOTE by Jerry: Corey Henderson,Henderson Performance Technologies, has engineered, fabricated parts,built & tuned the LT5 for "Dave's Obsession." Corey is also a team member at Bonneville to insure the "Heart of the Beast" keeps on ticking. For the 402 CID stroker I built up last year for my 94 ZR-1 I ran in to a problem of excessive cylinder leak down rates (>20%)on cylinders 1,2,7,& 8 after completing the final head bolt torquing pass while using a set of NOS OEM head gaskets. I pulled the heads off and did leak test with a 1/2" cover plate bolted to the head to confirm my suspicions that the excessive leakage was due to valve to valve seat sealing being sightly distorted when head bolts where torqued down to their final value. Sure enough with the cover plate installed all eight combustion chamber showed zero leakage through the valves which confirmed the valve seat sealing was okay. I then re-installed the heads with a set of Jerry's head gaskets measuring the cylinder leakage rate at each torque setting step by step. I was very please to see that leakage rate now remained well within acceptable limits (<10%) through the final torque setting pass. I'm confident this was due to the compressed thickness of Jerry's head gasket is more uniform between the graphite body material and fire ring areas compared to the OEM head gasket. This helps reduce the bending forces the head surface sees as the fire ring is compressed at the top of cylinder liner when the head bolts are torqued down. Another advantage of Jerry's head gasket is they are made of materials that are compatible with modern anti-freeze used today, unlike the OEM head gaskets which are known to fail if the wrong antifreeze type is used. In the meantime I've put around 3500 miles on the new motor with no head gasket issues to report. From this experience I can highly recommend this product to anyone looking for LT5 head gaskets. Click the button below to add the Gasket, Cylinder Head LH 90~95 [7.5B1] to your wish list.